Lisa Williamson, also known as Sister Souljah, is an author, lecturer, rap singer, activist, community organizer and political commentator. Through her music, books, lectures and community work she advocates black power, personal responsibility and activism. She proudly challenges black Americans to strengthen their communities and character by embracing spirituality and self-confidence. A New York Times best-selling author, Williamson now reaches the younger generation through her novels written in the popular style known as street-lit. Lisa Williamson was born in New York City in 1964. When her parents divorced, her mother moved the family into a public housing project in the Bronx where Lisa lived until the age of 10. The family then moved to Englewood, New Jersey where Lisa attended high school. While there she won the American Legion’s Constitutional Oratory Contest and was later enrolled in Cornell University’s advanced placement summer program and Spain’s Universidad de Salamanca study-abroad program. In 1985 Williamson graduated from Rutgers University with a degree in American history and African studies. Soon after her graduation she took a job with the United Church of Christ Commission for Racial Justice in Harlem where she founded the African Youth Survival Camp, a 6-week summer sleep away camp in Enfield, North Carolina serving children of homeless families. From 1995 to 2007 Williamson was executive director of Daddy’s House Social Programs, the non-profit charitable wing of Bad Boy Entertainment founded by Sean “P. Diddy” Combs. 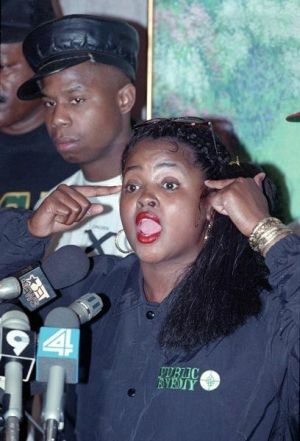 In 1995 at the age of 31, Williamson published an autobiography as Sister Souljah titled No Disrespect. Four years later she published her first novel The Coldest Winter Ever, which sold over a million copies. She followed with a 2008 novel Midnight: A Gangster Love Story, which became a New York Times bestseller in 2009. Two years later she published Midnight and the Meaning of Love. All of her novels are popular with inner city young people. With an interest in philosophy, history and culture, Williamson has worked at a medical center in Zimbabwe and traveled throughout Africa. She also has visited and lectured in Eastern Europe, England, France, Portugal, Finland and Holland. Williamson continues to lecture on issues of child abuse, sexual assault, domestic violence, and drug and alcohol abuse. She advocates for education and self-discipline as a way out of the cycle of poverty. Lisa Williamson lives in New York City with her husband Mike Rich and son Mike Jr. Sister Souljah, No Disrespect (New York: Times Books Random House, 1994); Sister Souljah, The Coldest Winter Ever (New York: Pocket Books, 1999); Akoto Ofori-Atla, “Sister Souljah: More Than a Street-Lit Author,” The Root (Summer 2011).